This is the heaviest of all standard ones. It is especially designed for heavy stressful work because of its good weight, thicker spine and has a special fitting of the blade to the hilt. It has a unique distinct handle where the metal of the blade (full tang) in the handle area is flat, not narrow and pointed as in other knives. The blade is therefore visible all around the handle. The handle is joined strongly to the blade with two metal rivets that can also be seen at the sides. 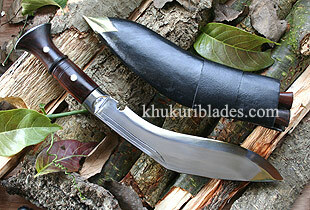 The blade is also forged similar to Angkhola version and given extra weight at the top part. A layer is clearly visible which gives additional weight to the blade. The balance is such that though heavier, it is easier to work with. It is a farmer’s first choice kukri because its like an axe.